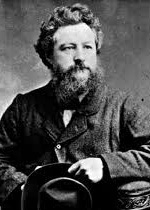 William Morris (1834-1896) was one of the most influential thinkers and artists of his time. At Oxford, with the painter Burne-Jones, he fell under the influence of Ruskin and Rossetti. Preoccupied with the poverty of modern design he taught himself at least thirteen crafts and founded his own design firm, Morris & Co. In the late 1870s he became active in political and environmentalist matters and converted to socialism in 1883, helping to found the Socialist League a year later. He was a leader of the Arts and Crafts movement (1860-1896), and founded his own publishing house, Kelmscott Press in 1891.